Publication Date 9th November 2018. 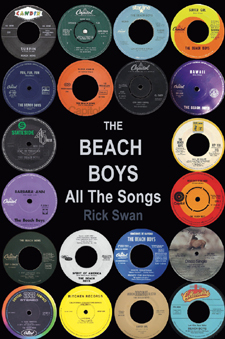 The Beach Boys: All The Songs is a detailed look at the recorded output of this most unique and influential popular music group. From the 1962 debut Surfin’ Safari through to 2012’s That's Why God Made the Radio — the first record Brian Wilson and the Beach Boys had made together in sixteen years. This book covers all the material released by the major labels. To qualify, a song must have been issued commercially and released under the name "Beach Boys." Some of the truly obscure are included, such as ‘Howdy from Maui’, a collaboration with Jeff Foxworthy from 1996. As well as covering the highest UK and US chart placings, each album is dissected with explanations on each song including songwriting credits and also includes background information to the making of each album. Documented in chronological order, each album release is given its own chapter and “orphaned” tracks such as B-sides and outtakes are also included within the appropriate time line. Author Rick Swann also provides bios for the key band members as well as the supporting musicians and the book is capped off with a full song title index for easy reference. longstanding fan, this detailed tome provides great insight into this most enduring band.